Farthest north, the quaint, historic village of Mayport is home to casino boats and seafood restaurants, offering their freshest catch. Dine on freshly-caught seafood, including the local specialty, Mayport shrimp. Then head over to Kathryn Abbey Hanna Park, providing what many consider to be Jacksonville’s favorite biking and hiking trails. 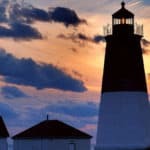 The park also offers camping and spectacular views of the Atlantic Ocean and surrounding wilderness. South of Mayport are the communities of Atlantic Beach and Neptune Beach. The intersection of Atlantic Beach and Neptune Beach is a hot spot where you can enjoy casual and upscale dining at places like Azurea Restaurant, diverse shopping options, and a very happening nightlife scene. Rounding things out is Jacksonville Beach. Get a tan, catch a wave on a boogie board, or have a picnic on the beach. At night, grab a blanket and head to the Sea Walk Pavilion on Jacksonville Beach for movies and music. Summer events include the Moonlight Movies Series and Summer Jazz concert series. Cap off the day with a pint from Jax Beach’s local breweries Green Room Brewery and Engine 15 Brewing Co. or a beachy cocktail at Flask & Cannon. Nightlife is also hot in Jacksonville Beach, with oceanfront clubs and intimate pubs. Over the course of a year, the temperature typically varies from 47°F to 90°F and is rarely below 35°F or above 95°F. The warm season lasts from May 25 to September 23 with an average daily high temperature above 85°F. The hottest day of the year is July 20, with an average high of 90°F and low of 76°F. The cold season lasts from December 4 to February 29 with an average daily high temperature below 68°F. The coldest day of the year is January 19, with an average low of 47°F and high of 62°F. There are two airports close to Jacksonville Beach, Florida. The closest airport to Jacksonville Beach is going to be Jacksonville International Airport which is 27 miles away. St. Augustine Airport is the next closest airport, and is approximately 32 miles from Vero Beach. To create a fair watch, go to AirFareWatchDog which will alert you when the flights are going down in price. Also check my airfare tips on how to make sure you are getting the lowest fare. For finding the lowest fare, go to CheapFlights. I find them to be the best for flight comparison, and getting the best deal if you are ready to purchase. Once you have your airfare, make sure you reserve your airport parking ahead of time. You can Save On Airport Parking and not have the last minute hassle (been there) of trying to get parking reserved. Rent a car in Jacksonville Beach FL and get ready to experience all the neighborhood has to offer! Why waste your precious vacation time waving down pricey taxis or trying to navigate confusing bus routes? CarRentals.com has cheap car rentals in Jacksonville Beach, Jacksonville that are perfect for your rental needs. Thinking about a two-seater for a romantic getaway? They’ve got you covered. Traveling with the whole family in tow? Let them help you find the spacious vehicle that’s right for you. No matter what type of car you require, they’re sure to have it in stock. On your next trip to Jacksonville Beach, think ahead and book your set of wheels right on CarRentals.com. There’s no better way to get around town than with your Jacksonville Beach rental car. And they always pair your vehicle with the lowest possible prices and the best deals. Say hello to more cash in your pocket to put toward the area’s top attractions! 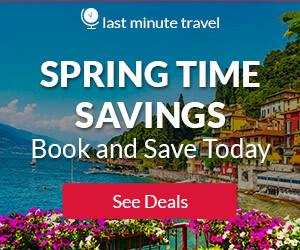 Book today and save on CarRentals.com. 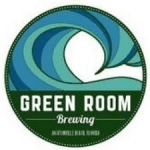 Green Room Brewing is Jacksonville Beach’s first microbrewery! Their goal is to bring great, locally made beer to the Beaches and beyond. They brew beers that interest the casual drinker and the beer aficionado. Feel free to bring that furry friend of yours to the bar! Just make sure that the pup has a leash and can play well with others. A great beer can complement a good meal. However, they don’t serve food, so feel free to bring your own! A binder of menus of restaurants that deliver is available at the bar! For more information call 904-201-9283 or visit Green Room Brewing. They’re Jacksonville Beach’s ultimate craft beer and growler store—bringing the highest quality craft brews to all you hop heads and casual beer drinkers alike. They offer many grab’n’go bottles and cans as well as 20 rotating taps ranging from local brews to regional and national craft beers. Just grab a 32oz. or 64oz. growler, fill ‘er up and take it virtually anywhere. They also have Crowlers®—ginormous 32oz. cans you can fill up with any really good beer you want. As craft beer experts, they’re always on the hunt for both popular and hard-to-find beers so check the beer list daily then drop by and see if they can help you discover your new favorite brew. 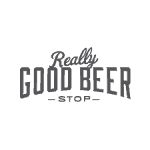 For more information call 904-372-0910 or visit Really Good Beer Stop. Set amongst the refreshingly relaxed beach atmosphere, The Wine Bar is the perfect marriage of a upscale aura combined with a an aroma of friendship. Their beloved bar is located in the heart of Jacksonville Beach, perfect for visitors and locals alike. Purporting the longest daily Happy Hour in Jax Beach, this gem of a bar boasts more than just wine: seasonally modified craft beers, house-crafted red and white sangria, fun and affordable Jell-o shots, and live music 4 nights a week. Fresh, handmade tapas procured from local sources and an extensive wine list featuring boutique-style wines creates a unique atmosphere unlike any other in the area. For more information call 904-372-0211 or visit The Wine Bar. 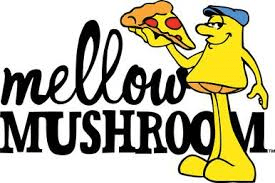 Mellow Mushroom is proud to serve Jacksonville Beach with delicious pizza, hoagies, calzones and salads. Providing quality food since 1974, they use fresh ingredients on all their menu items. Locally owned and operated by John and David Valentino, the Mellow Mushroom is more than just a pizza restaurant; it is where Jacksonville Beach pizza lovers and beer lovers gather. Their menu and locations are as eclectic as our fans. Join the beer club, shop our Mellow shirts and see the unique artwork in each of the locations. And yes it is true, they have a bus in the restaurant! It is a must see and a perfect place to hold a birthday party. They serve slices until 2 a.m. and a full menu until 1:30 a.m. For more information call 904-241-5600 or visit The Mellow Mushroom. 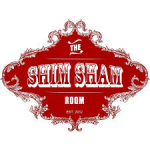 Welcome to The Shim Sham Room, a rock n’ roll cocktail lounge where the art of drinking is on display nightly. Never stuffy…The Shim Sham Room’s classically trained bartenders will lovingly create you everything from an extraordinary Old Fashioned to a Jager Bomb. Upon entering, you are greeted in the public house with comfortable seating and an expansive bar. Up the staircase and you’ve got their vintage spirit lounge with live music. Out back, you’ll find yourself in their secluded patio where smoking is permitted and yet another bar to take care of your drinking desires. For more information call 904-372-0781 or visit the Shim Sham Room. Located on the beach, Azurea remains true to its local surroundings, providing an elegant, artfully inspired atmosphere, where a view of the ocean is accessible from any seat in the house. Azurea showcases the area’s culinary movement with an eclectic tribute to the flavors of Europe, the Caribbean and the Americas. The menu changes with each season, representing the latest trends and finest ingredients. Following the swirling waves in the wall of glass, guests are led to Azurea’s ultra chic lounge that features an idyllic setting and delicious drinks. The outdoor veranda of the lounge also offers the perfect setting to enjoy a quality cigar or settle in by the fire pit with a cocktail in hand. The lounge provides community seating for a relaxed and sociable experience. Toast to an unforgettable evening with an ocean inspired cocktail, delicious martini or specialty mixed drink as you admire gorgeous sunset views. For more information call 904-249-7402 or visit Azurea Restaurant. Flaming Seafood & Shao Kao BBQ would like to introduce you to Shao Kao BBQ, which are a variety of meat and vegetables served on bamboo sticks. Shao Kao is a very popular street food in China, it’s also getting popular in NYC and LA. Our chef’s at Flaming’s use their knowledge of eastern spice and infuse it with western flavor to bring you this unique and delicious dining experience. Locally owned and locally prepared. For more information call 904-853-6398 or visit them on Yelp. Safe Harbor Seafood Restaurant is perched along the east edge of the Jacksonville Beach Boat ramp. A glance in any direction is rewarded with views of the majestic marsh and lively boating scene for which our city is so proud. The casual setting ensures comfort and relaxation will accompany your divinely fresh meal. For more information call 904-479-3474 or visit Safe Harbor Seafood Restaurant. Located in South Jacksonville Beach, Eleven South provides a warm and elegant setting to enjoy seasonally inspired world cuisine by our award winning team. Named for its distinctive location, just blocks from the ocean, Eleven South balances a casual environment, professional service and an exceptional menu offering, while maintaining a comfortable and inviting atmosphere. They believe fine dining can be fun and invite you try it first hand. You will see why so many of their customers go back time and time again and why so many love to say…Meet me at Eleven. For more information call 904-241-1112 or visit Eleven South. Their name reflects two things they value most: community and relationships. At Jaxon Social they celebrate all things Jacksonville, all things local. You may spot their chefs at the local green market and you’ll always find local craft brews ready to pour at their tap tables. They use local purveyors and choose locally grown food whenever possible. Of course, no community exists without relationships which brings us to social–the second part of their name. At Jaxon Social, they believe the experience of dining is as important as the food and drink, so go and be social with them. Put down your smartphones and experience dining unplugged. Their doors open, board games are on the patio, Chef Matt’s in the kitchen and Carissa’s behind the bar. You might even find Ben crowd-pleasing in the front of the house. For more information call 904-990-8573 or visit Jaxon Social. At the nexus of Atlantic Beach and Neptune Beach, these shops and restaurants offer entertainment, dining, and nightlife options in a beautiful ocean-side setting. Enjoy casual and upscale dining options as well as a happening nightlife scene. The Beaches Town Center is across the street from One Ocean Spa and Resort and where you can find the delicious Azurea restaurant. Another nearby local favorite is Pete’s Bar or Lemon Bar inside the Seahorse Oceanfront Inn. For more information call 904-241-1026 or visit Beaches Town Center. 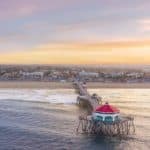 Thompson Surf School teaches everyone from beginner surfers looking to ride their first wave, to advanced surfers wanting to push their surfing to the next level! 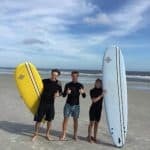 Their surf instruction is lead by professional surfer, and Jacksonville Beach native, Evan Thompson. Whether you want a private lesson, group lesson, coaching session, or surf camp, your next surf adventure starts here! For more information call 904-316-8573 or visit Thompson Surf School. Cradle Creek Preserve, the newest of Jacksonville Beach’s parks, is 43.3-acres of primarily undisturbed land along the Intracoastal Waterway. You can explore this special place by walking a system of nature trails and elevated boardwalks. 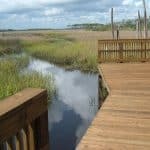 Pause and enjoy the panoramic views from the observation platform overlooking Pablo Creek Estuary or from the canoe and kayak landing pier. You can learn about the natural surroundings and rich history of the preserve through a series of educational signs. For more information call 904-247-6236 or visit Cradle Creek Preserve. Do you love the thrill of your heart racing when a monstrous fish strips the line from your reel? Does your heart pound as you gain control and lift an eight pound redfish from the water? Then it’s time to experience an adventure of a lifetime with Captain Kirk Waltz of Enterprise Fishing Charters. Captain Kirk Waltz is a U.S. Coast Guard Charter Captain with over 20 years experience. 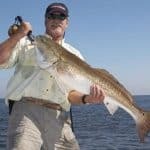 His intimate inshore and offshore knowledge of the Jacksonville area’s waters stretching from St. Augustine to Amelia Island assures you of the fishing opportunity of a lifetime. For more information call 904-241-7560 or visit Enterprise Fishing Charters. Jacksonville Beach is the prime location for kiteboarding lessons all year round, as well as Huguenot Park (Huguenot Memorial Park). Let them select kiteboarding gear that is appropriate for your body weight, size, riding style, and local conditions. They will set up your gear, adjust it for you, and teach you to use it safely! Kite self launches and landings can be difficult for beginning kiteboarders. Beginners are always welcome to join in on the beach, so you can watch others in training. It also lets you feel more secure with their help which is readily available. Call in advance for your kiteboarding lesson and meet them on the beach! 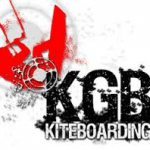 For more information call 904-434-8987 or visit them at KGB Kiteboarding. This property is 2 minutes walk from the beach. This Florida hotel is located on the beach and is within 5 minutes’ drive to downtown Jacksonville Beach. This hotel features an outdoor pool with beach views, a hot tub, and rooms with free WiFi. Courtyard Jacksonville Beach Oceanfront guests can workout in the fitness center or use the laundry facilities. Vending machines and dry cleaning are offered for a fee. The Bistro offers Starbucks Coffee, wine, and beer for purchase. Extras include a menu of light appetizers. A buffet breakfast and dinner are offered for an additional fee. For more information, pricing, or to reserve your room, visit Courtyard by Marriott Jacksonville Beach Oceanfront. This property is 1 minute walk from the beach. On the beach on the Atlantic Ocean coast, this hotel is right off Highway A1A. It offers an outdoor pool and free Wi-Fi. Spacious guest suites offer private balconies with ocean views. Four Points by Sheraton Jacksonville Beachfront has a fitness center and a business center on site for guest convenience. Bike rentals and a local shuttle service are also available. There is an on-site bar and restaurant featuring a hot breakfast daily. A snack bar is also on site. For more information, pricing, or to reserve your room, visit Four Points by Sheraton Jacksonville Beachfront. This property is 2 minutes walk from the beach. Located on a private beach on the shores of the Atlantic Ocean, this hotel features an outdoor pool with 4 water falls and a hot tub. Jacksonville International Airport is less than 29.8 miles away. Guests of the Oceanfront Jacksonville Beach Hampton Inn have access to the fitness and business centers. A launderette and on-site ATM are offered for added convenience. The Oasis Grill serves a daily breakfast buffet. Guests can also enjoy an afternoon cocktail at the Tides Oceanfront Tiki Bar. For more information, pricing, or to reserve your room, visit Hampton Inn Oceanfront Jacksonville Beach. This property is a 15-minute walk from the beach. Less than one mile from the beautiful beaches on the Atlantic Ocean, this Jacksonville Beach hotel features an outdoor pool and spacious rooms with free Wi-Fi and a flat-screen cable TV. Guests can enjoy free access to the on-site fitness room or relax in the hot tub. Bicycle rentals are available and the front desk and a business center is on site. The Jacksonville Beach Holiday Inn includes a daily hot breakfast. Exceeds expectations! Travelers who stayed at this property said it exceeded their expectations. For more information, pricing, or to reserve your room, visit Holiday Inn Express – Jacksonville Beach. 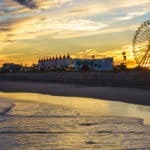 I haven’t been to the Florida coast yet so your blog has helped me learn some highlights. Thanks so much for the information. I’m planning to be there for next winter. I can’t wait to go. I have not heard of Jacksonville Beach but sharing your information as you have gives insight into what mostly only the locals know about. I think you will really enjoy the Florida Beaches and Jacksonville beach is great. Please let me know if you need any other information. I can’t get enough of following your posts. Every time you show an amazing place in the world where I would love to have a few days break from the routine and the problems. I would really love a holiday 🙂 I see there are many things to do in Jacksonville.Many restaurants pubs, beach bars…the best time to go, i suppose is in June or when do you think I can find the best prices?you understand, to not be hight season price. I like your website, and I can see that youâ€™re a real beach fan. Your website is uncluttered, well laid out, and attractive. Youâ€™ve obviously done your research, and coupling that with your experiences, you make the beaches come alive. Who knows? I just might visit Jacksonville Beach one day! Great Elaine! I am glad I could help. Please let me know if there is anything else you need. Jacksonville looks absolutely fantastic. I assume that it is even better in reality. I love uncrowded beaches. It relaxes me. I will put this beach on my bucket list for my next holiday. I didn’t find any question left to ask as you have given all the information needed for an ideal family vacation! Thank you and glad everything you needed was in one place. I hope to see you soon at Jacksonville beach! Oh, to dream of the perfect vacation spot! You have made my imagination run wild. Especially since the last 4 days here have been with freezing temperatures where I am. I like the look of your site and the ease of navigation. You have definitely done your research, and I plan on bookmarking your site. Right now vacations are just dreams in my world, but someday soon I will use your resources and knowledge to go places. Thank you. Well, that does sound like a great place. Especially when it is freezing cold up here. I’m talking negatives lol. You have really made this sound like a great vacationing spot. The white, sandy beaches part is what dos it for me. The beer also, plenty of beer :).It looks like Jacksonville has everything in one place that you would want. Good pizza, craft brews, beaches, and I’ve always wanted to take a shot at kiteboarding. Thanks for the read and maybe I’ll go there soon. Yes, I agree that Jacksonville Beach does have everything you would need to enjoy a great beach vacation! Of course, I love most beaches in Florida. Thank you so much for reading! Most of my trips to Jacksonville have been on business. Never made it to the beach. Made several trips to St. Augustine. You make it very inviting to plan a trip down that way while it is cold up north here.You have covered the main things that will need to be researched for a trip to the Jacksonville beach area. I did purchase a Dolphin Sofa Table with a glass top in Jacksonville about 20 years ago, still have it. Are there any good shopping areas for Florida type stuff still left in the area, kinda like ST. Johns pass in St. Pete Beach. Yes, and I know St. Johns pass. Absolutely love St. Pete the best. And yes, you can find the same Florida stuff there as well. I am moving there, so I have been collecting stuff every chance I get for my new home. Thanks for visiting Beach Travel Destinations! Lived in the Riverview area for 6 years in the 90’s. Worked too many hours to enjoy the area. Now that I am retired, the move back may happen. I am with you John. I visit often, but I am actually moving that direction in a matter of months! I can’t wait. I will be at the beach almost daily I am sure! Florida Beaches are awesome! What a great Idea for Vacations!!!! Jacksonville Beach Vacations looks like a dream. White sand beaches, with plenty of beachfront and walking distance accommodations, the beaches are a quick and easy to escape from the everyday… It sounds like the perfect holiday. Thank you very much for the useful information you have included in your article.!! Thank you Kiki for stopping by and learning more about Jacksonville Beach. You will enjoy a visit here for sure! Wow, thank you for providing me with so much valuable information! I’ve heard really great things about Jacksonville Beach, so have been considering a beach vacation there. I was wondering out of all the hotels you have listed, if you have a favorite…as far as luxury goes? I was previously thinking about the Hampton Inn, but you mention on your site that the Courtyard has been recently renovated. I guess I’m wondering if you have a preference between the two? Thanks for your help! You know, both hotel lines are great. I always love staying in a newly renovated hotel. Just that everything is fresh and new. You will enjoy Jacksonville Beach! I was looking at vacation in Florida and read your post on jacksonville beach vacations. Everything I need to book my vacation is on your post, from car rentals to hotels and airports. Thanks. Just one question. I see there are fishing charters as well. Can you tell me what kind of fish we can expect to catch in Jacksonville? You can catch Redfish, Sea Trout, Flounder, Tarpon, Cobia, Black Drum, Jack Crevalle, Snook, Kingfish, Bluefish, Triple Tail, Snappers, Ladyfish, and others! There are a lot of different fish to be caught. Thanks for reading! Great Josephine, I am glad I could help and eeeww I hate murky water for sure. I like to be able to see my feet. Glad you enjoyed reading! Such an informative article! Makes me want to pack up and leave right now. I like how you have broken everything down into sections. I don’t really need to go anywhere else for information. You have covered pretty much everything I need to know about travelling to jacksonville beach. Thanks for taking the time to do all the work for me! You are very welcome Maxine 🙂 If you need any help with anything else, please let me know. Wow what a thorough article, thanks for the great read. 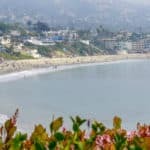 I like that you list pretty much everything you will need to know about this destination and cover ground on what many people will find interesting to do there. When some focus on the “things to do” section, they often just focuz on restaurants and night life activities, but I’m glad you put actual sports and recreation. Not everyone travels to party, so that was refreshing to see. Yes, I like to have things to do when I vacation….not just sit around and eat and drink. Thanks for reading about Jacksonville beach vacations!